The ENGINE consists of a pair of single cylinder rotative beam engines driving on to a common crank shaft. The two engines are identical, with 23 inch bore and 61 inch stroke working at 5 psi, rated at 20 horse power and a maximum speed of 40 rpm. The engines were installed on site in 1829. The BOILERS in the boiler house next to the engine house are of the Cornish pattern having a single centre furnace tube. These boilers were installed in the 1870's to replace original boilers of the 'wagon' type. The Cornish boilers supplied saturated steam at 5 psi and were wood fired. 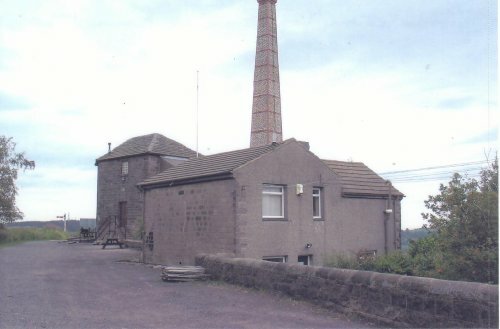 The boiler house was originally without a roof, which was added later. The brick built chimney is 80 feet high. Taken 1940s by E R Morten. Enlargement. The gent on the right has his foot on the cable running on a pulley between the rails to haul wagons up Middleton Incline. William Hallows, 4 Sept 1836 / 28 Oct 1913 (Son of Samuel Hallows born 1806 + Hannah Young) + Mary Sheldon, were married in 1856 at Matlock. 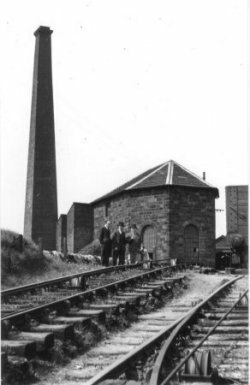 They lived for many years at the Middleton Top Engine House. In the 1861 Census, William Hallows (Shown as Hollows) was living at the Engine House alone, and was described as head of household and married. His two year old son Ralph was living with his Grandparents, John and Sarah Sheldon at, 2 Chapel Hill, Matlock. I did not find his wife Mary and their baby daughter Hannah. In the 1871 Census, William and Mary were living at the Engine House with their five children: Ralph 12, Hannah 10, Mary 5, William 3, (My Mother's Father, re photo: William Hallows + Mary Goodwin.) and John 10 months. In the 1881 Census, William and Mary were living at the Engine House with their eight children: As before plus: Sarah Ann 8, Elizabeth 6, and Emma 4. There was also a lodger living there. 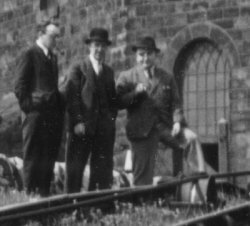 William lost a leg in an accident at work and when he recovered he worked in the High Peak Junction Workshops until retirement. In the 1891 Census, William's youngest brother Samuel Hallows and his wife Elizabeth Parker were living at the Engine House with their five children: Samuel James 22, George 20, Albert 17, Ralph 14 and Herbert 13. In the 1881 Census they lived at Hopton Engine House. I hope this is enough info for you to get an interesting write up to go with the photograph. When I get more information on the Hallows Pedigree I will be pleased to send you an updated .txt file.